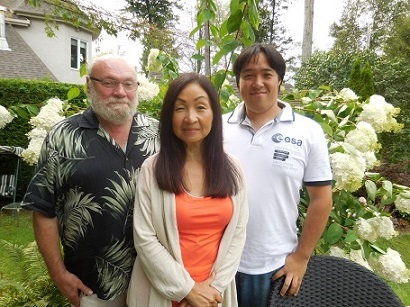 On Saturday, August 29, I was invited to Dr. Claude=Yves Charron’s house in a suburb of Montreal, where I had a very enjoyable conversation with Dr. Charron, his wife Misa Hira along with their son Michio over lunch in their backyard. First, Dr. Charron pointed out some delays and gaps in information about Japan in Quebec with virtually no reference to Japan’s politics, business, or society in the mass media these days. Even though Japan has sometimes been mentioned in connection with the Trans-Pacific Partnership agreement, no analysis is done regarding its geopolitical implications on Japan vis-à-vis China’s hegemony in the Asia-Pacific region. However, he said that despite this lack of information about Japan in the mass media, which may at least partly be due to the insufficient information disseminated from Japan, more and more people, both young and old, seem to be attracted to Japanese culture and society and attending various events and exhibitions about Japan, such as Otakuthon, which is Quebec’s largest anime convention, and the Hiroshima memorial concert by the Montreal Symphony Orchestra and its music director, Kent Nagano (http://www.rcinet.ca/fr/2015/08/05/hiroshima-70-ans-apres-montreal-sen-souvient/). Then, Mrs. Misa Hirai, who is teaching Japanese at the University of Quebec at Montreal, commented that the enrollment in her Japanese language course started to increase significant three years ago and is about 350 students this year, almost three times as many as those studying the Chinese language. According to her, this may well be due to students’ increasing interest in Japan’s pop culture such as manga, anime, games, movies, fashion, design, etc., and this seems to be a good first step toward wider interests in Japanese culture, history and society in general. Later their son Michio joined the conversation, saying that quite a few friends of his, who actively participated in Otakuthon and other similar events, have visited Japan and wanted to stay there, but visiting Japan is one thing and living there is another. There are still numerous obstacles for foreigners to live even in a cosmopolitan city like Tokyo, such as formal restrictions and informal discriminations on residential arrangements and professional activities. He pointed out the example of Canadian anime song singer, HIMEKA, who had to give up her career in Japan last year for failing to find a new agency to sponsor her stay after a several years of successful singing career in Japan. Michio himself, while having mostly enjoyed his stay in Tokyo on his internship program a couple of years ago, sometimes found it difficult to adapt to Japanese behavior at work such as long working hours, staying up with his colleagues until 10 or 11pm. As a conclusion, the four of us, including myself, agreed that while we all recognize and appreciate so many interesting and valuable contents, events and heritages in Japan, there is much room for improvement and reform to make them more visible and acceptable to the general public in Canada and elsewhere around the world. On Monday, August 31, I visited the Ministry of International Relations and Francophonie (MRIF) at the Headquarter Building in Quebec city, where I was greeted by three officials in charge of Asia and Japan, M. Donald Leblanc (Asia-Pacific, Latin America and Caribbean Director), Mme Maude Cote (Chief of the Japan, Korea and Oceania Desk), and M. Etienne Baillargeon (Officer at the Japan, Korea and Oceania Desk). The main purpose of my visit was to exchange opinions and information with the Quebec officials about recent cultural activities concerning both Japan and Quebec. First, in response to a surprisingly strong interest in Japan’s pop culture and the “Cool Japan” concept on the part of the Quebec officials, I tried to outline the recent strategy of the Japanese government to promote and support Japan’s popular culture such as anime, manga, games, films, fashion, design, cuisine, etc. for the purpose of marketing culture-related goods and services abroad as well as attracting foreign tourists to Japan in connection with the 2016 Summit in Mie Prefecture and the 2020 Olympics in Tokyo. The timing and location for our discussion on this subject matter seemed perfect, as the National Museum of Fine Arts of Quebec near the Parliament Building (http://www.mnbaq.org/) was featuring the special exhibitions about Japan, “Inspiration Japan" (Japonism) and “Nippon-Fiction" (a Quebec artist’s traditional Japanese-style pop culture), which I enjoyed viewing, prior to my meeting at the Ministry. 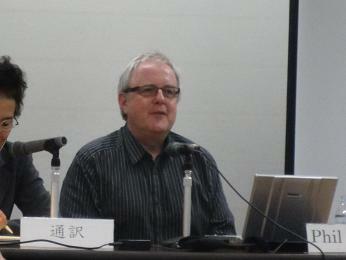 Then, we discussed possible ways to encourage the exchange of artists and creators between Japan and Quebec. As pointed out by the officials, a number of Quebec artists such as dance performers have visited Japan for a short stay supported by the Quebec government, but there has not been any such arrangement for Japanese artists to stay in Quebec supported by the Japanese government so far, and it might well be under consideration by the Japanese government in the context of the Cool Japan strategy, especially in some pop culture fields such as anime, manga, games, films, cuisine, etc. Then our discussion led to a possibility of creating a kind of “matching site” as a platform to introduce artists and creators on one hand and sponsors and business people on the other to facilitate mutual exchange of information and possibly business interaction between Japan and Quebec. However, the important question about this idea is how to meet the “quality” and “legal” requirements for real collaboration between them across national boundaries. 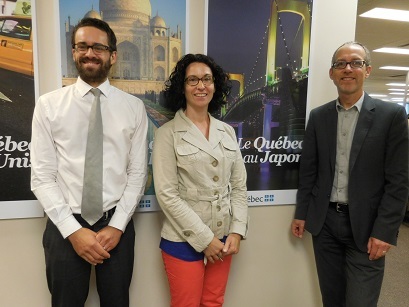 Our tentative conclusion was that as a first step professional organizations such as film industries in Japan and Quebec could be interested in creating a platform for more active interactions between Japanese and Quebec film industries. As a result of this kind of step-by-step approach, a more comprehensive, across-the-board matching platform for artists/creators and hosting/business organizations might emerge in the long run. All this discussion took place within an hour just as scheduled, which implies how efficient the Quebec government, or at least the MRIF, operates, and I truly enjoyed talking with those three officials in such a friendly and productive manner, hoping that Japanese government officials could learn from them in this respect. 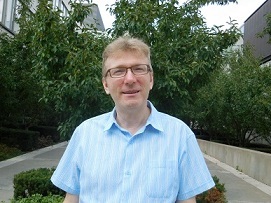 On Wednesday, September 2, I visited York University in Toronto, where I met Professor Marcel Martel and asked him about his current research interest. Since it was just before the fall semester starts, the campus was very quiet and we had a leisurely conversation over lunch at a nice faculty dining room. 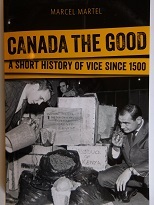 First, Prof. Martel referred to his new book, “Canada the Good: A Short History of Vice since 1500” (2014), which was a basis for some of the speeches that he gave in Japan last year. Then, in response to my question about his current research agenda, he said he is now working on the issue of the “Canadian identity,” which is yet to be defined and shared by all citizens in a society, where most of the　English-speaking Canadians celebrate Queen Victoria’s Birthday, French-speaking Canadians honor St Jean-Baptiste Day, etc. That sounded like an ever-lingering problem in what might be called a “mosaic” society, rather than a “melting pot” like the United States of America. So, I am anxious to know a conclusion, however tentative, of his ambitious research to deal with this problem. Then, our conversation turned to the topic of Japanese popular culture such as anime, manga and sushi, which are attracting more and more attention from Torontonians these days, according to Prof. Martel. He pointed out that, especially in the case of Japanese food, it has become so popular, because it is healthy to each fish and vegetables, which are the main ingredient of Japanese cuisine. This “high culture” aspect might also apply to other genres of Japanese pop culture such as anime, where Hayao Miyazaki’s artistic works have made Japanese amine a kind of fine art, rather than children’s comics, leading to the wide popularity among the young and the old all over the world. Prof. Martel and I agreed that it would be quite interesting to study the history and strategy of a country’s popular culture to penetrate into other countries with different cultural backgrounds from the comparative viewpoint, such as Japanese vs. Korean pop culture accepted in North America in somewhat different ways. Q1: Why have the two societies differed from each other? Q2: What can Japan learn from Quebec society and its change? → Aerospace, information, multimedia, pharmaceutical, biotech, environment, etc. “Galapagos”-like development of Japan’s technologies and industries. Mr. Phil Wood, as a leading proponent of “interculturalism,” gave a talk about the benefits of diverse people interacting with each other in city development. After emphasizing the importance of a change in mindset about diversity, not as a threat but as an opportunity for creativity and innovation, Mr. Wood critically reviewed the past city policies for immigrants in Europe, namely, “guest worker policy” in the UK, “assimilation city policy” in France, and “multicultural city policy” in Scandinavian countries. Rather than adopting such policies that fail to encourage the interaction of diverse people including immigrants, cities should take the “intercultural cities” approach to give reasons and incentives for diverse people to interact, along with places, institutions, agents and tools of interaction. In other words, the city might be regarded not as a static machine but as a dynamic ecosystem, where social conflicts are managed rather than suppressed in order to achieve the diversity advantage of human interaction, according to Mr. Wood. Finally, he gave his reflections on Japan regarding interculturalism, and pointed out the existence of fears and barriers which are preventing accommodation of diverse people including foreigners in many Japanese cities. At the same time, however, Mr. Wood took note of many city administrators and community leaders who are capable of dealing with potential conflicts and creating diverse advantage for their cities and regions, such as Hamamatsu City with emphasis on public education for all children including foreigners living in the city. Throughout his talk and Q&A session, Mr. Wood’s positive and optimistic attitude toward interculturalism was quite impressive and persuasive, making the audience feel a little better about the future of city life in the globalized world. Miyao Lecture: "What Japan Can Learn from Quebec"
Based on students’ responses to a questionnaire on what Japan can learn most from Quebec, Prof. Miyao lectured on the strengths of Quebec compared to Japan in each of the following areas: political leadership, economic vitality, frontier technology, public relations diplomacy, social reform, cultural strategy, and language policy. It was concluded that in all of these areas, especially the political initiative for the project of a generation “Plan Nord”, Japan could learn a lot from Quebec in order to overcome the two decades of stagnation and revitalize its economy and society. After the lecture, the students’ interests in Quebec seem to be broadened from culture and languages to include political, economic and social aspects, according to their revised responses to the same questions given before the lecture.